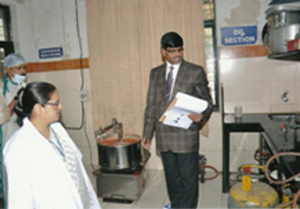 The department has well equipped laboratories with advanced instrumentation. It has a very good collection of specimens, models and charts for the conduct of practical session for the students. We have one electric furnace for the preparation of bhasmas. We have conducted a department seminar in the College and a department for manufacturing medicines for the College hospitals. The department is all set to take up further research projects in the domain. Rasashastra & Bhaishajya kalpana is one of the most important branches of Ayurveda. It basically deals with the preparation of Ayurvedic medicines using Mercury, various metals, minerals and also various herbs. This subjects is a part of syllabus of 2nd year B.A.M.S. course. The Department is fully equipped with various instruments, specimens, Models, charts.etc. All essential practicals are carried out in the U.G. Laboratory as per M.U.H.S. 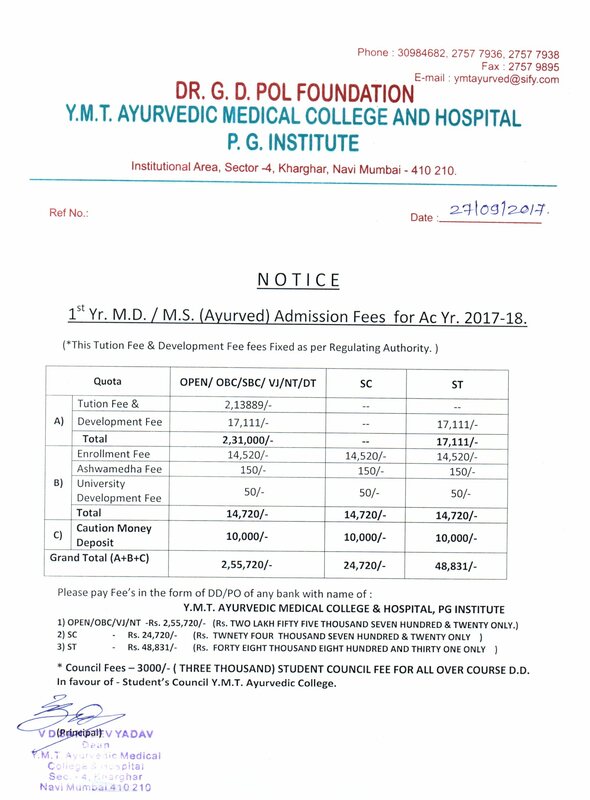 syllabus. There is also an in-house pharmacy which was established more than twenty years before. Post Graduation course in this subject was started in the year 2008, till date eleven no. of students have completed their post graduation. Total intake capacity for P.G. is 8 students per year Three P.G. students have received scholarship from C.C.R.A.S. for their Research Work till date. There is a separate Research Laboratory for P.G. section which has been designed as per C.C.I.M. norms. P.G. Diploma in Rasashastra & Bhaishajya kalpana (Ayurvedic Ph armacology & Pharmaceutics) is expected in the nearest future. 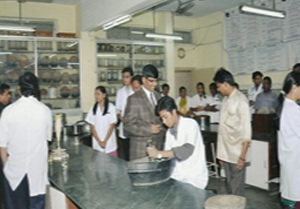 Preparation of various Ayurvedic formulations so as to incur practical knowledge among students. Arrange visits to various G.M.P. approved Pharmacies, R & D centers & Pharmacy colleges. Encourage and Guide the P. G. students to prepare various untouched & exclusive Rasakalpas (e.g. Pottali kalpas) mentioned in Rasagranthas. Focus on Analytical study for the Standardization of Rasakalpas. 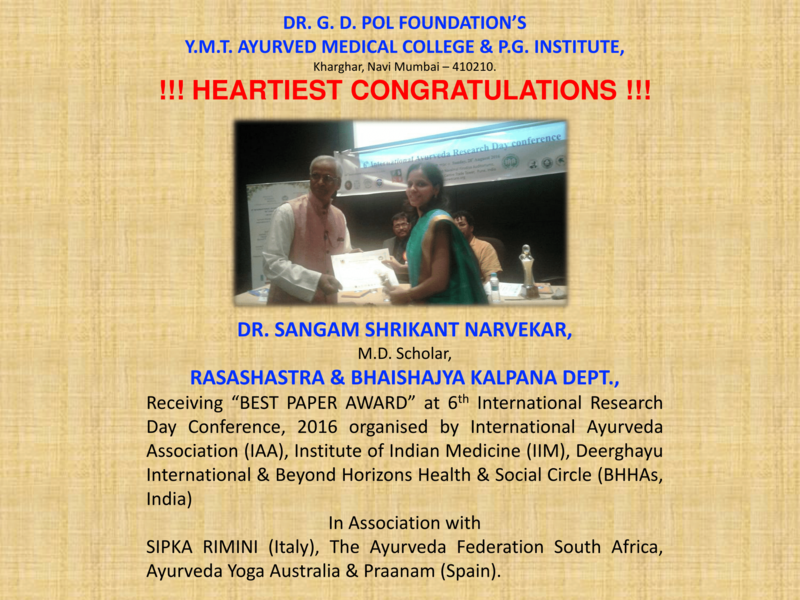 Built up a strong foundation for future Ayurvedic Pharmacists & Rasavaidyas. Well maintained departmental library containing Books, Dissertations & Journals. In house Pharmacy- Various types of Ayurvedic medicines are prepared at pharmacy. Research Laboratory- It is provided with various Modern Analytical Instruments and all research practicals are performed here. The physico-chemical tests of the medicines prepared in our pharmacy are done in the Research laboratory for the purpose of Quality control. Organisation of Workshop on Ayurvediya Aushadhi Nirman in 1996 & 1998 for B.A.M.S. students. Pharmaceutical study of Parad Ashtasanskara. Quality Control Study of Final Products of the Pharmacy. Preparation of Kupipakwa Rasayanas & Various Bhasmas inculding Suvarna, Rajata & Mukta bhasma. Preparation & Dispensing of Guduchyadi Kashaya for prevention of Swine flu. 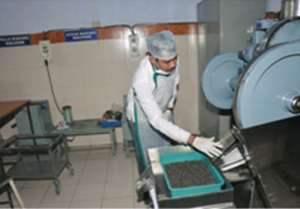 We prepare most of ayurvedic medicines in our pharmacy for OPD & IPD. Departmental projects for UG and PG students. In house raw drugs identification.